People seem fascinated by things that appear strange or unique. The sheer immensity of the Galapagos tortoise is a big part of its popularity with the zoo-going public. The size of the African Spurred tortoise, Geochelone sulcata, boosts its popularity in the pet trade. Another tortoise that has been a perennial pet trade animal because of its unique appearance is the Pancake tortoise, Malacochersus tornieri. Its bizarre, flattened profile makes it a sought-after animal in both zoological institutions and private collections. This desirability has affected the native populations of Pancake tortoises, effects which currently are being investigated by researchers. New research such as this is also answering many questions concerning the natural history of this fascinating tortoise. The nooks, crannies and crevices in rock piles and outcrops can provide protection for a number of species of animals. Tortoises with their hard shells may seem an unlikely animal to utilize this habitat, but the Pancake tortoise has evolved to do just that. Unlike most tortoises, Pancakes do not possess rigid, high, thick shells. Although they can reach a length of approximately seven inches, they rarely exceed an inch to an inch and a half in height. With this flat, pancake-like profile, Malacochersus tornieri is able to fit into narrow crevices and cracks, and thus exploit an environment that no other tortoise is capable of using. The shell of a Pancake tortoise is very flexible and can be bent and depressed with only mild pressure, allowing the tortoise to squeeze into very tight openings. Years ago, before the common name "Pancake tortoise" became popular, Malacochersus tornieri was known as the "Softshell" tortoise because of this pliability. The softness of the shell comes from the underlying structure of the bones. Most tortoises' bones are solid, with very little space between the individual bones under the carapace and plastron. However, in the Pancake tortoise these bones have many openings, or fenestrations, in them. Juveniles of other tortoise species possess similar fenestrations in their bones which fill in as the tortoise grows, leaving the carapace and plastron solid and inflexible. This growth apparently does not occur in Malacochersus tornieri. Pancake tortoises are incredibly well adapted for the rocky outcrops, called kopjes, of south-eastern Africa where they are found. Other adaptations in addition to their flexible, flattened profile aid the tortoise in its home. When a tortoise is in its favorite crevice, it rotates its legs, bracing itself and forcing its carapace up against the rock. In this position it is almost impossible to remove. There have been conflicting opinions concerning the ability of the Pancake tortoise to expand its body to help wedge itself into narrow crevices. Early reports by Loveridge and Williams indicated that such an inflation did occur, but L. C. Ireland and Carl Gans in 1972 examined captive Pancakes and found no evidence for it. 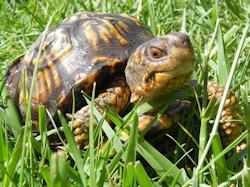 However, more recently, Richard Moll and Michael Klemens inspected tortoises in their native environment and reported that they could expand their bodies. They showed that the tortoise possesses a diamond-shaped region on its plastron that is extremely flexible, moving out when the tortoise draws in its legs. The combination of these two defensive maneuvers renders Pancake tortoises virtually immovable. Unfortunately, cracks and crevices only provide protection if you can reach them. Luckily for the Pancake tortoise, less bone means a lighter animal, so Pancakes can move more quickly than tortoises with a thick shell. It is quite possible that they are the fastest tortoises in the world. When threatened, a Pancake will not crouch down and withdraw into its shell. Instead, it will make a dash for the nearest rocky shelter. Pancake tortoises tend not to stray very far from protection, and they also seem to be able to locate their favorite hideaways quickly when displaced. Finally, the Pancake's flat shell and extreme agility allow it to flip itself over quickly when it lands on its back, a handy ability for a tortoise that spends most of its time climbing around on boulders and rocky hills. In their natural element, individual animals can be very hard to spot. Although they leave their cracks and fissures to bask in the sun and to eat, the brown or horn color of their carapace, combined with a random pattern of radiating lines on each scute, allows Pancake tortoises to blend into the background, making them difficult to see. In this regard, their coloration is similar to other smaller tortoises, such as the Padlopers (Homopus species) of South Africa or the more widely distributed Hingeback tortoises (Kinixys species). The coloration and patterning of the carapace and plastron is quite variable, and can fade with age. The shapes of the Pancake tortoise's head, legs, feet and other body parts are similar to those of many other tortoises. Males can be identified by their longer and thicker tails relative to the females and by their smaller overall size. Pancake tortoises are confined to a small natural range in south-eastern Africa, occurring in Kenya and Tanzania. Most groups of Malacochersus tornieri can be found in dry areas of scrub brush on rocky hills or outcroppings. The kopjes populated by Pancake tortoises reach an elevation of 1800 meters. Tortoises living at these higher elevations have adapted to cooler temperatures; average temperatures in their range usually are around 24 to 30 degrees C, but can drop as low as 12 degrees C.
The natural history of Pancake tortoises in Tanzania has recently been investigated in depth by Don Moll and Michael Klemens, greatly expanding our knowledge of the tortoise's habits. The researchers found that although there is some variation in Pancake tortoise habitat, there are some common elements. Most of the inhabited crevices were quite deep, had uncluttered rock floors and were located near a convenient route to the ground, presumably to allow the tortoises easy access to feeding areas. The crevices also usually tapered to a height of 5 centimeters at some point. Tortoises can wedge themselves into this narrow area for protection. Crevices that fit these criteria are usually found in weathered, but not disintegrating, outcrops. Older kopjes are often too broken up to provide suitable shelter, while unweathered rocky areas do not have deep crevices. Suitable habitats of sufficient size to support a viable population of Pancake tortoises can be separated by large distances. Within one habitat, however, tortoises coexist peacefully, with multiple individuals sharing favored crevices. The usual grouping found by Moll and Klemens was a male-female pairing, but up to ten tortoises have been seen in one crevice. The data collected by the researchers indicate that males may move from crevice to crevice, while females tend to stay at a single location. However, although intriguing, these data are still preliminary. Other reptiles were also found within the Pancake tortoises' homes in Tanzania by Moll and Klemens. These included agamas, geckos, skinks, and plated lizards. Presumably these animals take advantage of the protection of cracks and crevices in the same manner as the Pancake tortoises. Moll and Klemens found a number of Pancake tortoises that had been killed. The most likely culprits were small predators such as mongooses. Grasses and vegetation constitute the majority of the diet of a Pancake tortoise. The exact food is dependent which species grow in the area and on the season of the year. Plants such as star grass, red oat grass, aloe, and Achyranthes leaves were eaten by tortoises in the Tanzanian study group. Other researchers have reported similar diets, although some populations of tortoises also eat seeds and nuts. Standing water is rare in the kopjes except during the rainy season. Presumably during the rest of the year, the vegetation upon which the tortoises feed provides an adequate supply of water. Of course, in order to eat Pancake tortoises must leave the safety of their crevices. Tortoises in Tanzania were seen outside their crevices at many different times during the day, spending approximately one half hour each time foraging and occasionally resting. Other researchers also have reported Pancakes basking or moving about in search of food. 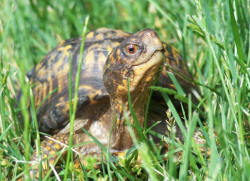 Pancake tortoises, especially the males, are reported to become somewhat more active during the breeding season. Mating among Pancake tortoises in the wild occurs near the beginning of the year, with nesting in July or August. Females that have successfully mated will usually lay a single egg, burying it under three to four inches of loose, sandy dirt. One female can lay multiple eggs over the course of a single season, with eggs appearing every six weeks to two months. Each egg is about two inches long, but only half this in width. Incubation seems to last for 4.5 to 6 months, but incubation lengths of over eight months have been reported. Hatchling Pancake tortoises look like hatchlings of many other tortoise species. Typically, they are dark yellow, with brown or black markings on the scutes on both their plastron and carapace. Their carapace is even slightly domed, unlike that of their parents! Upon hatching, juvenile Pancake tortoises are about one and a half inches long, and more circular than adults. As they age, they gradually adopt the more normal rectangular shape of an adult Pancake tortoise. A second study by Klemens and Moll examined the status of Malacochersus tornieri in its native habitat, and the effect that the extensive trade in wild-caught animals has had on the Pancake tortoise population in Tanzania. While it has long been assumed that the high level of trade in these tortoises has had a severe impact on the wild populations, real data have been lacking. Now, with this study, the common assumption has been proven to be correct. Habitat that is suitable for Pancake tortoises is not common or extensive when found, limiting the size of the Pancake tortoise population in those habitats. Klemens and Moll investigated habitats that were pristine and habitats that had been raided for the pet trade. They found that unexploited areas have a higher population density, with more adults than in the exploited populations. Juveniles made up a higher percentage of the tortoises found in raided areas, probably because young tortoises are harder to locate and extract from crevices, as they can retreat further than the larger adults. Given the low reproductive rate of Pancake tortoises, populations that have been plundered may take a long time to recover, if they haven't been reduced past a sustainable level already. Habitats within protected areas such as national parks are less likely to be ransacked, but even there some populations appear to have been impacted by collecting. Tortoises are collected by local hunters who deal with a local middleman. Animals are occasionally stockpiled in local areas until an order for tortoises arrives from an exporter. These exporters contact the local middlemen, obtain the necessary permits, and ship the animals to wildlife importers in Europe and the United States. Individual collection sites can be responsible for the collection of hundreds of tortoises at a time. Local hunters only receive a few cents per tortoise, with the middlemen making less than 50 cents per animal. Once collected, tortoises face a potentially long wait until exported, and then must survive the stressful exportation process. Recently the Tanzanian government has reduced drastically the number of exported tortoises, and the European Economic Community has banned their import. The number of Pancake tortoises entering the United States has dropped, and prices for Pancake tortoises have risen in the last few years. Perhaps these changes will convince more commercial turtle breeders to begin working with Pancake tortoises. Given the documented problems with wild-caught tortoises, anyone wishing to keep Malacochersus tornieri should locate a reputable Pancake tortoise breeder. The small size and unusual appearance of Pancake tortoises make them desirable animals for both individual and institution collections. Fortunately they can be hardy captives if their needs are properly addressed. Although small compared to some tortoises, they still require a large area with multiple hiding spots, at least equal to the number of Pancakes kept, and preferably more. The area should be furnished with a variety of surfaces, including rocks, for the tortoises to climb around and over. When designing the environment, keep in mind the common elements of their natural crevices. A sand pit four or five inches deep should also be available, especially if breeding is desired. Remember that Pancake tortoises are excellent climbers - they will scale any wall that is too low and disappear under the refrigerator, stereo cabinet, or similar heavy item of furniture if indoors, or disappear entirely, probably forever, if outdoors. Pancake tortoises in captivity will eat many of the same things as they will in the wild, and drier grasses and alfalfa should be provided to add bulk and fiber to their diet. Tortoises will also take food such as lettuces, squash, carrot, broccoli, green beans, cabbage, some melons, and occasionally other fruit as well. Vitamin supplements are not essential if a varied diet is provided, although a small amount can be given infrequently. A water bowl can be provided, although they may only use it rarely. Alternately, tortoises can be misted heavily with a house plant mister once or twice a week. A once or twice monthly soak in warm water can also be beneficial. In captivity tortoises will mate year-round, but breeding success can be increased by providing the Pancakes with a yearly light cycle in which the length of the day varies over the course of the year, similar to that provided for other turtles, snakes, and lizards. If two or more males are kept together, they will sometimes fight over the females, who tend to ignore the males unless the males are actively pursuing or circling them. One male in our collection consistently waited until the females were eating in the morning before approaching and mounting them from behind. The females would often continue eating for quite a while before noticing the presence of the male. Some breeders report increased success with larger groups of tortoises, as combat between males may stimulate mating and increase fertility. Although most females only lay one egg at a time, each Pancake can produce multiple clutches with a six to eight week gap between layings. The egg is approximately two inches long and one inch wide - surprisingly big relative to the size of the tortoise! Eggs are usually laid in sandy soil, although some tortoises will deposit eggs in out-of-the-way places in the cage if they find the nesting area unsuitable. Females that are producing eggs should have calcium and vitamin supplements added to their diet to allow for proper egg and embryo development and to prevent vitamin and calcium deficiencies in the adult. Unfortunately, some breeders have reported low fertility in eggs laid in captivity. A number of things may play a role in this infertility, including dietary inadequacies, a missing factor or factors in the captive environment, or incompatibility between tortoises from differing parts of their native range. Eggs incubated at approximately 30 degrees Celsius seem to take from 140 to 190 days to hatch. For example, animals hatched after 122, 145, 147, and 160 days (Slavens, 1994) of incubation. However, incubation lengths of over eight months have been reported. Hatchlings and juveniles will consume the same foods that adults eat, although growing animals should be given additional calcium and vitamin supplements to insure proper growth. Hatchlings should not be overfed, as this may adversely affect their growth. Pancake tortoises can be hardy and long-lived in captivity. Frank Slavens' Reptiles and Amphibians in Captivity (1994 edition), notes that the National Zoo in Washington D.C. has a female that has been in captivity for over a quarter of a century, as it was acquired in 1965. Captive breeding programs have been successful in zoos and private collections around the country and few problems have been reported in rearing captive born animals. These successes in breeding and long-term care are heartening. Anyone keeping Pancakes should strongly consider establishing a breeding group. Given the fragility of native populations, only captive-born tortoises should be entering the pet trade. Successful breeding projects for other tortoises such as Leopard tortoises, Sulcatas, and Redfoots have shown that animals need not be continually removed from wild populations to satisfy people's desire to keep these fascinating creatures, and hopefully the Pancake tortoise will be another success story in tortoise husbandry. Connor, M. J. (1992). The Pancake Tortoise. The Tortuga Gazette 28(11): 1-3. Darlington, A. F. and R. B. Davis (1990). Reproduction in the Pancake Tortoise, Malacochersus tornieri, in Captive Collections. Herp Review 21(1): 16-18. Eglis, A. (1967). Flat and Fast: The Pancake Tortoise. International Turtle and Tortoise Society Journal 1(2): 29, 44-45. Ernst, C. H. and R. W. Barbour (1989). Turtles of the World. Washington D.C., Smithsonian Institution Press. Highfield, A. C. (1990). Keeping and Breeding Tortoises in Captivity. Avon, GB, R & A Publishing, Ltd.
Kirkpatrick, D. T. (1993). The Pancake Tortoise. Reptile & Amphibian Magazine 22 (May/June): 2-9. Klemens, M. W. and D. Moll (1995). An assessment of the effects of commercial exploitation on the pancake tortoise, Malacochersus tornieri, in Tanzania. Chelonian Conservation and Biology 1(3): 197-206. Moll, D. and M. W. Klemens (1996). Ecological Characteristics of the Pancake Tortoise, Malacochersus tornieri, in Tanzania. Chelonian Conservation and Biology 2(1): 26-35. Pritchard, P. C. H. (1979). Encyclopedia of Turtles. Neptune, N.J., TFH Publications, Inc.
Slavens, F. L. and K. Slavens (1994). Reptiles and Amphibians in Captivity: Breeding, Longevity and Inventory (Current January 1, 1994). Seattle, Slaveware. This article copyright © 1997 by David T. Kirkpatrick. Reprinting of this article for non-profit purposes is permitted provided that it is unaltered and appropriate attribution, including copyright information, is included. Please notify the author of any reprinting.